Swedish fashion retailer Lindex is breaking new ground when it comes to embracing bloggers. The company has already created an affiliate programme for fashion bloggers and makes it easy for bloggers to link to individual garments via a “blog this” button (see below) which gives bloggers a code to copy a photo into their own blogs. Today Lindex became the first e-commerce site to partner with Twingly, the Swedish-based company who’s service shows which blogs that link to a specific page. 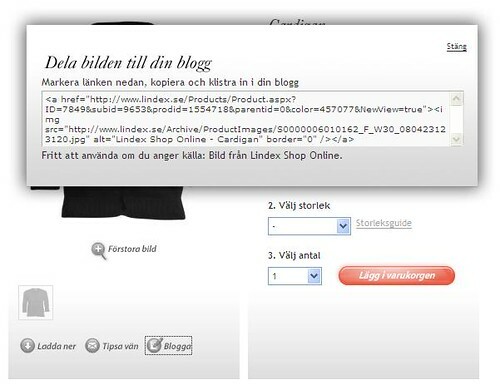 In other words, not only does Lindex use blogs to drive traffic to their web shop but they are also able to send traffic back to bloggers by showing links to their blog posts, which in turn will encourage more fashion bloggers to link to lindex.se. This is a great way of building value for both the bloggers and the company, and hopefully also to other visitors to the site that are able to get more information and viewpoints on different clothes they might consider buying. Tags: lindex, fashion, mode, twingly, modebloggar, lindex. Ping.